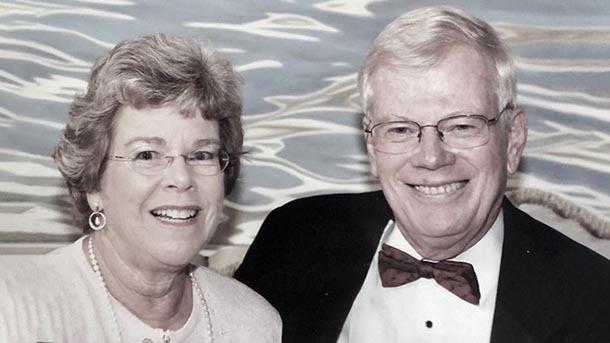 UNIVERSITY PARK, Pa. — Penn State industrial engineering alumnus William Korb and his wife, Wendy, who is also a Penn State graduate, have contributed $100,000 to fund and endow three Open Doors Scholarships in the College of Engineering. Each gift, matched 2:1 by Penn State for a combined total of $300,000 in new scholarships, will support undergraduate students participating in RaiseMe, the Pathway to Success Summer Start Program (PaSSS), the Student Transitional Experiences Program (STEP), Complete Penn State or Smart Track to Success. “We have a strong belief that there’s hardly a better investment that we can make than with the education of a young student. It is just a great investment,” said William Korb. The William and Wendy Korb Open Doors Scholarship in the College of Engineering I, which will ultimately be endowed at $90,000, will support Penn State World Campus undergraduate students participating in the Smart Track to Success program, which offers scholarship support, a two-semester course on academic and life skills, mentoring from peers and faculty and assistance in becoming an engaged member of the World Campus community. To be endowed at $120,000, the William and Wendy Korb Open Doors Scholarship in Engineering II will support undergraduate students in the College of Engineering who meet financial need requirements through STEP, a summer transition program for students who are making the junior year transition to University Park after starting at another Penn State campus. Through coursework, mentoring, and a six-week workshop series, students become familiar with University Park people, opportunities and resources. Lastly, the William and Wendy Korb Open Doors Scholarship in Engineering III, to be endowed at $90,000, will support undergraduate students participating in Complete Penn State. This structured program provides counseling and support to students who are identified as at risk for not graduating due to unexpected hardship, such as a parent’s illness or job loss. Students in this program are eligible for scholarships to assist them in completing their degree. In order to qualify for the program, students must have a minimum GPA of 2.0, be within 30 credits of earning their degree and demonstrate unmet financial need as they enter their final two semesters. In addition, the Korbs established two Open Doors Scholarships at Penn State Behrend: one for Behrend students participating in the PaSSS program, and a second for Behrend students in the Complete Penn State program. The PaSSS program helps entering students in making the transition to Penn State in the summer before their first year, in acquiring learning skills, establishing connections and earning credits that will help them to graduate on time. Those who successfully complete the first session can return for a second summer. With an initial combined gift of just over $100,000 — coupled with the 2:1 University match — the two William and Wendy Korb Open Doors Scholarships at Penn State Behrend total just over $300,000. An Erie native, William Korb attended Penn State Behrend for two years before graduating from University Park with a degree in industrial engineering. He is the retired president and CEO of Gilbarco, the world’s leading supplier of fuel dispensers, credit card readers and point-of-scale devices for gasoline stations. The Korbs have been long-time supporters of Penn State engineering, both at the Behrend and University Park campuses. In 2002, the Korbs established the Korb Family Trustee Scholarship in Engineering at Behrend, and in 2014 and 2015, they gifted approximately $1.34 million to create the William and Wendy Korb Early Career Professorship in Industrial Engineering and the William and Wendy Korb Early Career Professorship in Biomedical Engineering, designed to support talented engineering faculty at the start of their academic careers. This gift from William and Wendy Korb will advance “A Greater Penn State for 21st Century Excellence,” a focused campaign that seeks to elevate Penn State’s position as a leading public university in a world defined by rapid change and global connections. With the support of alumni and friends, “A Greater Penn State” seeks to fulfill the three key imperatives of a 21st-century public university: keeping the doors to higher education open to hardworking students regardless of financial well-being; creating transformative experiences that go beyond the classroom; and impacting the world by fueling discovery, innovation and entrepreneurship. To learn more about “A Greater Penn State for 21st Century Excellence,” visit greaterpennstate.psu.edu.